Home » Biology » Physiology and Anatomy » Vision: How do our eyes work? Normal vision. No correction needed. Short sighted vision, and using a lens to correct the issue. 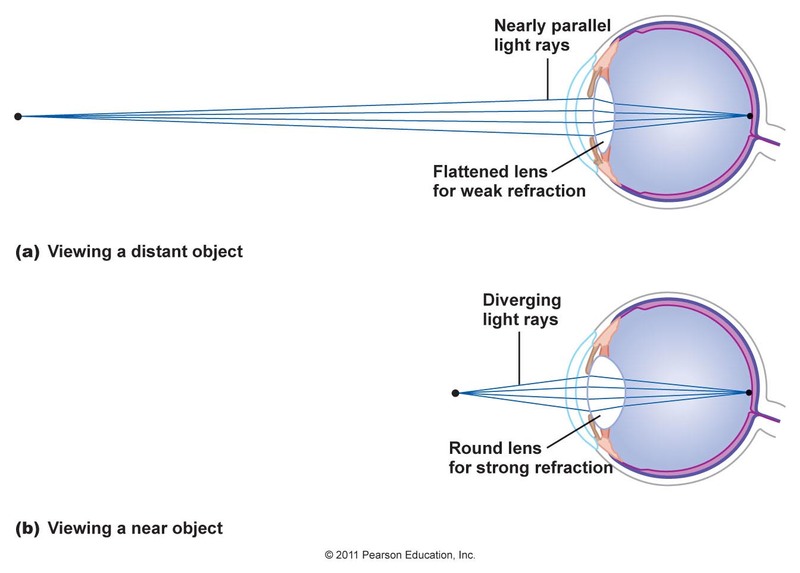 Far-sighted vision, and using a lens to correct the issue. These images are from Zeiss.com Optics & the Eye. ZEISS does work in the optical and optoelectronic industry. How do muscles help focusing? The muscles can pull or relax: this changes the shape of the cornea and lens, and thus allows the eye to re-focus light rays as needed. 1. 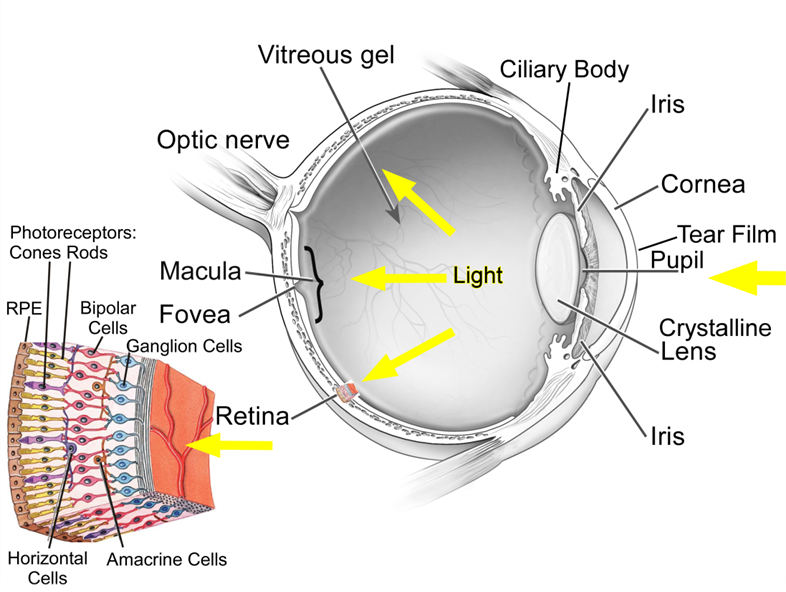 Light moves through the lens of the eye to the back of the eye, which is the retina. Here, there are millions of rods and cones. 2. When light hits the discs in the outer segment of the rods and cones, the little bits of light (photons) activate the cells. Rods can be activated in low light, but cones require much brighter light (many more photons). Most of the light not absorbed by the rods or cones are absorbed by the epithelial cells behind them. The discs hold rhodopsin, a special molecule that changes shape when activated by light. This shape change allows rhodopsin to activate a second special protein molecule that then starts causing other changes involved in sending a visual signal. For the signal to be sent through the cell, charged molecules called ions are let in and out of the cell in an action potential. 3. When the signal reaches the inner end (left side) of the rods and cones, the signal is passed to sets of neural cells. 4. 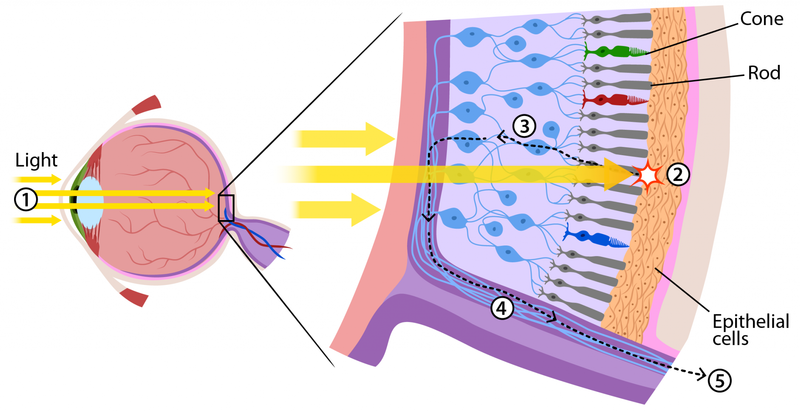 The signal moves through neural cells in the optic nerve. 5. The optic nerve will send this information to the brain, where separate signals can be processed so you see them as a complete image. * Color photos (printed or painted) made using just four dyes: magenta, cyan, yellow (subtractive primaries) and black. Mixing in differing proportions can reproduce almost any image or color. The mammalian eye has evolved over time. In evolution, natural selection allows new structures to be built from an adaptation of an old structure, which lets things get done, but not ideally. The process leads to a numerous defects.